One of the most borrowed books in our library. A dizzying amount of detailed pictorial information ... clearly and fascinatingly captioned. 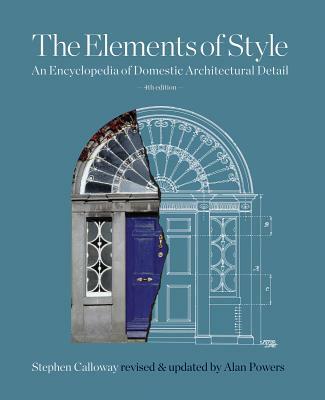 The Elements of Style is the most comprehensive visual survey, period by period, feature by feature, of the key styles in American and British domestic architecture from the Tudor period to present day. A valuable reference guide, the book is designed for owners of period houses, restorers, architects, interior designers and all those interested in our architectural heritage. This revised edition includes a fully updated chapter covering the Contemporary era (1975--present) and a new list of suppliers and resources. More than 3,000 analytical drawings and historical engravings, 500 color and 1,000 black-and-white photographs provide a clearly presented guide to the features appropriate for every part of a building. Major components, such as doors, windows, walls, floors, ceilings and staircases, the small but important embellishments, such as molding and door hardware, and permanent or semi-permanent fixtures, such as lighting and wallcoverings, populate this wide-ranging encyclopedic resource. A system of color-coded tabs enables the reader to compare specific features as they have evolved over time. Additional information on restoration and maintenance, biographies of key architects, and a detailed glossary are included. Stephen Calloway is Curator of Prints and Books at the Victoria and Albert Museum, London, and author, lecturer and consultant on architecture, interior design and the history of taste. He has contributed to numerous periodicals, including The World of Interiors and Architectural Digest, and is the author of Twentieth-Century Design and Baroque Baroque. Alan Powers is a Senior Lecturer at the University of Greenwich School of Architecture and Landscape, London. He is the author of several books on English architecture and decorative arts, including Living with Books, and is a regular contributor to Country Life and other magazines. Elizabeth Cromley is Professor of Architecture at Northeastern University, Boston. She is the author of Alone Together: A History of New York's Early Apartments, and co-editor of a variety of essays and books on vernacular architecture.